​IPS has extensive experience in providing consulting services to Government and Corporate clients across a range of organisational development and leadership activities. Often viewed as People and Capability processes, our ability to mobilise specific subject matter experts to navigate our clients’ requirements sets us apart. This, coupled with the knowledge that our directors are pragmatic, hands on and current professionals, provides comfort and delivery for our clients. ​Our broad range of industry experience includes government (federal and states), engineering, mining, defence, Indigenous business sector, site services, recruitment and not for profits. This diversity provides our clients with deeper and different opportunities and insights within our service/ program delivery. 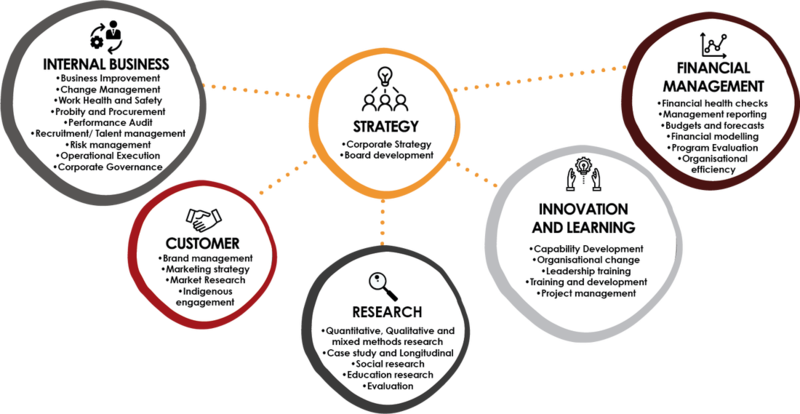 IPS has developed the capability, personnel, systems, and processes to successfully deliver a range of research and evaluation projects which are unique in their methodology and delivery. Our process is completely client-centric, with a strong focus on communication between our clients at each stage of the project, conducted by a research team which executes a solution-focussed methodology, capable of producing an exceptional, quality product. IPS’s research manager, Dr Katie Roe, is a mixed methods specialist regularly utilising both qualitative and quantitative research methods to provide data rich reports that are both broad and deep. The IPS research team has extensive experience with quantitative research including CATI interviews, online surveys, paper-based surveys and face to face surveys. Qualitative methods of data collection used by IPS include focus groups, workshops and group discussions, individual face to face interviews and observation. All data collection and analysis is conducted in-house utilising specialised software where appropriate. IPS has extensive capabilities and experience conducting evaluations for government and corporate sectors. IPS utilises an evaluation approach grounded in realism meaning that when we evaluate a program, we consider the ‘material’ and ‘social’ worlds critically important, with direct impact on a program’s success or otherwise. We also have the philosophy that evaluation is not linear in nature but cyclic where processes are implemented, measured and adapted as necessary on a regular basis. Our evaluation practices ensure that programs are undergoing constant change and refinement to better meet the client’s aims, objectives and outcomes of the program. A longitudinal project in its fourth year, the research involved a quantitative analysis. The data was collected using two subcontractors via online and CATI platforms. IPS analysed the quantitative data and produced a comprehensive report. The report was presented to the Minister for Communications and the Arts. IPS has been engaged to conduct case studies into 18 remote Aboriginal communities and cattle stations to ascertain whether current aerodrome facilities and air services are meeting current needs and will meet their future needs. IPS has facilitated numerous interviews, analysed qualitative data and is currently producing 12 case studies and a comprehensive report detailing each site. IPS was engaged to conduct an international investigation into the bauxite market focusing on current suppliers including quantity and quality produced, current purchasers and volumes purchased, current and future uses of and opportunities for bauxite and associated financials. The report was used to inform the Kalumburu Bauxite Project. IPS conducted an evaluation of the Aboriginal Youth Transition Program for the Department of Training and Workforce Development. IPS conducted interviews with program staff, stakeholders and Aboriginal youth who had participated in the program. The qualitative interview data will be analysed in conjunction with the quantitative statistical data collected but the department to produce a comprehensive evaluation of the program at each location and collectively. IPS conducted an evaluation of the Central Coast Local Health District’s provision of Aboriginal Health. Through an extensive document review and qualitative interviews, IPS reviewed the overall structure of the CCLHD with the aim of improving organisational structure and services to Aboriginal people. IPS continues to successfully deliver programs and services to enhance and develop business capabilities and capacity. Our team members hold broad experience including Chairperson of an ASX listed business, executive roles within APS, executive roles within Tier 1 contracting organisations as well as specialist small business consultants. Within our network we generally have an advisor to suit any level of client requirement or engagement. ​Our services include business or department strategy development and execution, workshop delivery and design, procurement support, corporate and business health checks, business advisory services, financial management and reviews, work health and safety auditing and consulting and bespoke/ specialist consultancy services. IPS designed, developed and delivered a series of Procurement Workshops Australia wide for Indigenous Business Australia. The focus of the workshop was to develop practical skills for use in responding to tenders, and featured practical examples designed to develop capability learned skills that can be immediately applied. The program was well received with 95% of participants rating the program excellent or good. IBA has recently contracted IPS to deliver another seven workshops around Australia. IPS has been engaged by Indigenous Business Australia to work with Indigenous Businesses to enhance their effectiveness in competitive business environments. IPS conducts a review of the business’ current capabilities and develops revised capability statements, supplier profiles and business websites. IPS also reviews and provides feedback on Tender Submissions to improve future capability. ​IPS has been engaged by the Department of Prime Minister and Cabinet to provide business advisory services to Indigenous businesses in regional and remote Australia under the Indigenous Entrepreneurs Fund. Under the program, IPS has provided specialist Business Advisors located in Perth, Adelaide and Townsville to work alongside Departmental teams to support Indigenous business growth. ​We provide a suite of relevant, targeted, effective communication services, delivered through a variety of channels, to produce outstanding results. We also provide tailored branding services to give your organisation an across-the-board consistent and professional look. From websites to brand redesigns, report writing to communication plans, we can provide the specialist communication and creative services you need.